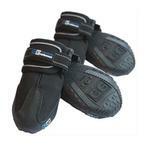 Give your dog the ultimate in paw protection in the form of a molded, durable and low-profile boot. Keep your active pup on the right path to good health with our Ultimate Trail Dog Boot by Canine Equipment! These high-quality boots feature ergonomically molded high-traction, all-terrain soles. These Ultimate Trail Dog Boots provide your pup all-terrain and all-season protection from rocks, urban debris (broken glass, etc. ), hot pavement, salted ice, and more. Because dog paws are differently sized from front to back, these boots are sized to accommodate the needs of your pet's front and rear paws! This assures your pet will have an optimal fit. The cinching hook and loop closure keeps the boots on through walking, running, and playing. The low-profile design minimizes the bulk and enhances fit while the ergonomic shape maximizes paw support. 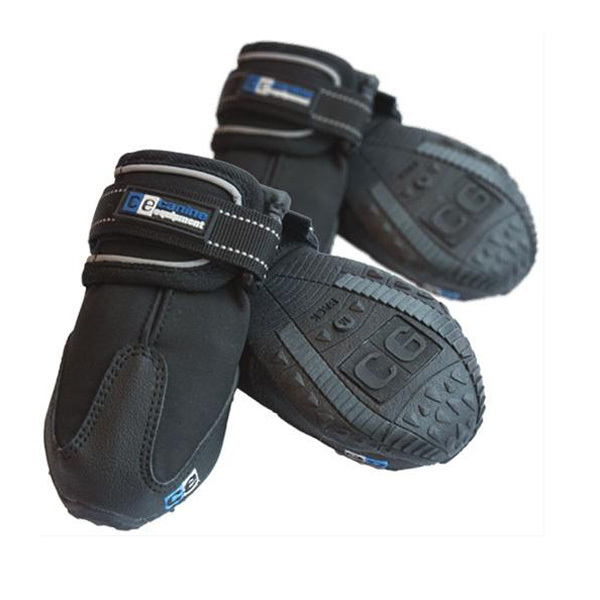 These boots are easy to put on your dog thanks to the wide gusset. Once your dog's paw is positioned in the boot, collapse the gusset shut and secure it with the sticky tab. Next, cinch and wrap the touch fastener strap for a secure fit. Gently tug the boots to make sure they are secure. For first-time wearers, it is important to start your fun-filled activity right away to redirect your dog's attention and to start a positive association with wearing the boots. Once your dog has gotten more accustomed to the boot, tighten the ankle strap a little more to ensure a secure fit. Soon enough, your dog will learn that putting on the Ultimate Trail Boots means fun has begun! Ultimate Trail Dog Boot - Black Customer Photos - Send us your photo! He started with socks on for his hot spots he loved them then he ended up getting yeast infections between his toes so the vet suggested boots we went with these boots ! Wow amazing there the real deal! We took him out Christmas Day for the first time he loved them he was enjoying his walks for the first time stress free he would look at us like thanks mom and dad for keeping my feet warm and dry, they flex with the foot and have a sole for better form and fit easy to put on and there labeled "front" and "back" on the bottom. They have two Velcro straps and stay on wonderful have taken him out over a dozen times and never had one fall off!! Best product worth every dollar !! Posted On 04/07/17 by Gweynn Hampel from Lakewood, OH Yes, Gweynn Hampel recommends this product! These boots are easy to put on and very sturdy. I am happy with my selection. Posted On 02/21/17 by Cynthia J B from Omaha, NE Yes, Cynthia J B recommends this product! Liked the boot! Easy to get on and they stay on! Posted On 02/08/17 by Jack P from Cape Mears , OR Yes, Jack P recommends this product! I had to order a smaller size, but they appear to be good quality and should hold up well. Posted On 10/15/16 by James S from , Yes, James S recommends this product! I have an English Mastiff. His paws dried out this winter and this has made the wood floor very slippery for him. These shoes fit very well, and have given him incredible stability. They seem comfortable because he hasn't tried to remove them at all. I would definitley recommend them to other dog owners. Posted On 07/06/16 by Nikki from Sydney, Australia, Yes, Nikki recommends this product! We have tried plenty of shoes for our frenchie to protect his back paws when he walks as he can't pick them up completely. (He has spinal troubles) These shoes fit well and seem very flexible to his paws. They are easy to put on and he doesn't mind them on at all. Posted On 06/03/16 by TL from , Yes, TL recommends this product! Went to Death Valley in these and are amazed at the rugged terrain we went through. Love that their are different sizes for the front and the back. Posted On 05/10/16 by TL from , Yes, TL recommends this product! I have recently adopted a very small dog and I have found that searching for affordable products to keep this wee little baby warm has been difficult.